A tire pressure monitoring system (TPMS) is an electronic system designed to monitor the air pressure inside the pneumatic tires on various types of vehicles. 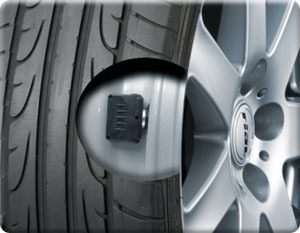 TPMS monitors the actual air pressure inside each tire via a sensor mounted within the tire behind the air valve. TPMS report real-time tire-pressure information to the driver of the vehicle, either via a gauge, a pictogram display, or a simple low-pressure warning light (which is to represent a flattened tire with exclamation point). These systems were created for the luxury lines, with the first passenger vehicle to adopt it was the Porsche 959 in 1986. Since then, the system has proven that it can help you avoid traffic accidents due to under-inflated tires by early recognition of the malfunction of tires. It also increases overall fuel efficiency. Do you remember the Firestone recall from the late 1990s? More than 100 automotive fatalities were attributed to Firestone tires that lost their tread when they were run underinflated, and friction heated them beyond their capability to handle. The tires blew out or delaminated, and this led to the rollover of the vehicles they were on. This pushed the Clinton administration to legislate the TREAD Act. The Act mandated the use of a suitable TPMS technology in all light motor vehicles (under 10,000 pounds), to help alert drivers of severe under-inflation events. 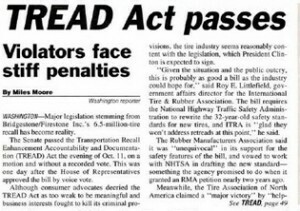 In 2012, the National Highway Safety Administration (NHTSA) through the Motor Vehicle Safety Act has made it illegal for an automobile repair facility to knowingly not re-install a functioning TPMS system if vehicle arrived at facility with functioning TPMS system. Basically, if a vehicle came into your shop with working a TPMS, it must leave the show with a working TPMS. 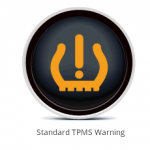 There are special considerations to be made when changing tires equipped with a TPMS sensor. If done incorrectly, a sensor can be broken and that will only add to your customer’s frustration and your shop’s cost. Only trained tire maintenance professionals should handle tires with this system. Watch Eagle Equipment’s short video on how-to remove and install tires from the rim without damaging the TPMS sensor. Previous Previous post: Outdoor Car Lifts: Can You Do It?